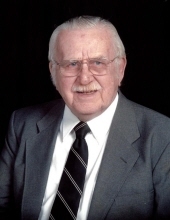 Kenneth J. Schaefer, age 91 of Brookfield, WI passed away peacefully, with family at his side, on Sunday, March 17, 2019 following a year-long illness. He was born on August 19,1927 in Basswood, Richland County, WI the son of Andrew and Anna (Studnicka) Schaefer. Ken’s parents ran the Basswood General Store. As a youth, Ken was a high achiever both academically and in numerous sports offered at school. He was proud of his achievements but was always humble and extended that trait on to his children and grandchildren. Ken was a WWII veteran who proudly served in the United States Navy. He met his future wife, Mary Farrell while at college. They married on June 9, 1949 and celebrated 55 years together before Mary’s death in 2004. Ken and Mary had two children, Sue and Kevin. Ken was involved in education throughout his career as a teacher, principal and representing an educational publishing company. He was an advocate of the disabled and supported Special Olympics. Professionally and privately, Ken was the consummate educator and role model in every sense of the word. Through the years, Ken enjoyed traveling with his family, spending time in the country, hunting and fishing with family and friends, golfing and restoring cars. He liked Studebakers and shared that interest with his grandson, Christopher. Ken was devoted to his Catholic faith and a member of the Knights of Columbus. A remarkable person, Ken is dearly loved and greatly missed. Survivors include his daughter, Suzanne (Jeffrey) Brown of Brookfield, a son, Kevin Schaefer of Jefferson, three grandchildren, Christopher Brown of Brookfield, Jennifer (Jarvis) Erickson of Brookfield, and Meredith (David) Moseley of Tomah, and three great-grandchildren. He was preceded in death by his parents, Andrew and Anna Schaefer, his wife, Mary T. Schaefer, three brothers: Charles, Andrew and Martin, two sisters: Irene Tracy and Virginia Tracy, and infant grandson, Kenneth John Brown. A Mass of Christian Burial will be held on Wednesday, March 27, 2019 at 11:00 A.M. at St. Mary the Assumption Catholic Church in Richland Center. Monsignor Michael Gorman will officiate with burial in the church cemetery where military graveside rites will be conducted by the Local Veterans Military Memorial Honors Unit. Visitation will be held on Tuesday, March 26, 2019 at the Stafford Funeral Home from 4:30 P.M.-6:00 P.M. with a rosary to be prayed at 4:00 P.M. Visitation will also be held at the church on Wednesday from 10:00 A.M. until the time of Mass at 11:00 A.M.
A rosary will the prayed at 4:00 p.m.
"Email Address" would like to share the life celebration of Kenneth J. Schaefer. Click on the "link" to go to share a favorite memory or leave a condolence message for the family.